Instead of trashing old cars in scrap yards, Lexus has come up with a better way to put to rest retired vehicles. In an effort to promote recycling for cars, the company broke down a CT Hybrid car and used the 2000 and more components to create some pretty fashion-forward apparel! The parts were given by the luxury automaker to four designers who then put their art and talent to use to come up with astounding finished pieces which will feature in a six-page advertising campaign in the January 2012 issue of the Vogue magazine. Using everything from crank bearings, transmission starters and exhaust manifold gaskets to armrest upholstery, these costumes sure as hell seem to be bred for the cat walk. Why use bricks and the conformist materials for building your abode, when you could instead to the world and the environment as a whole a big favor and use recycled bottles instead! 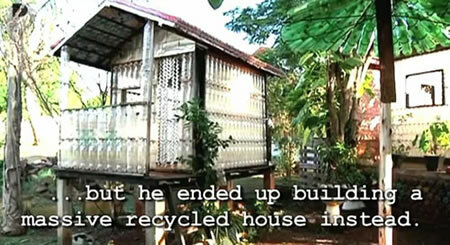 Alfredo Santa Cruz literally turned trash into a roof above his head using some 24,000 bottles to build La Casa Ecologica de Botellas, a place he calls home. Filled with sand or water for fireproofing purposes, these bottles have also found a place inside the home, being used to create furnishings. Recycling isn’t limited to urban areas alone and is an activity that can envelope the whole world for the greener good. 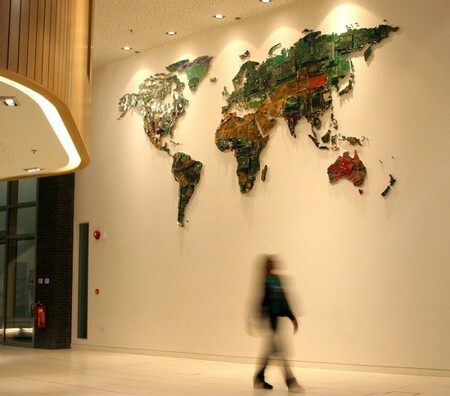 To portray just that, UK-based artist and designer Susan Stockwell came up with this beautiful work of art, the world map made from recycled computer parts. The components were sourced from the University of Bedfordshire and the installment is simply called the “World”. Stockwell began work on this one in 2010 and used motherboards, electrical wiring, fans and other such components donated by the Secure IT Recycling. With the 2012 London Olympics coming up, Coca-Cola is now gearing up to make sure the mess is cleaned up, well in advance. In a joint venture with ECO Plastics, Coca-Cola will soon kick off operations at Continuum Recycling located in North Lincolnshire. 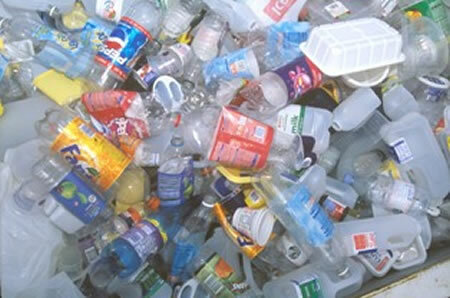 All clear PET bottles will be taken in for recycling and the move will help double the current production of food grade recycled PET plastic in the UK from 35,000 tonnes in 2010 to more than 75,000 tonnes. These bottles, once recycled, will help produce about 80 million new Coke bottles in a span of six weeks from the date of the Closing Ceremony of the Olympics. Batman would have wanted one of these. Maybe for its looks, but for the common man with no super powers to boast, this is a pretty neat recycled BMW lookalike. 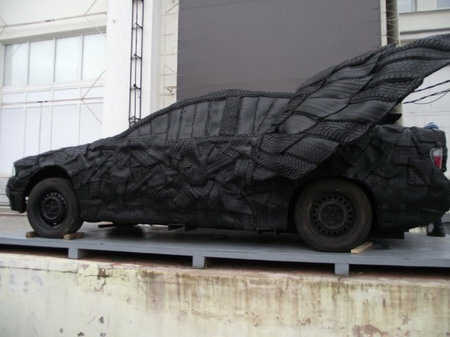 In the city of Perm in Russia, this car was spotted featuring recycled tires and with wings. It is artistically done and makes you awe at the effort and thought that has gone into it. There isn’t much more than this we know about this winged model. But this is art and here it is to stare and admire in all its glory. The next time you crumple a page before tossing it in a bin, stop short and think just how useful that waste bit of paper could get! Take Jennifer Collier’s works for example. The designer uses bits and pieces of paper to sculpt out 3D sculptures! Hailing from Britain, Collier sews these paper sheets like fabric and shapes them into 3D sculptures, well-detailed and cleverly designed. 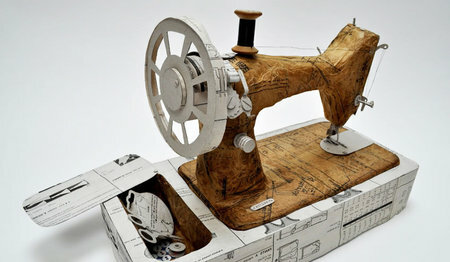 Using type writer manuals to create a typewriter, old phone directories to create a telephone and old photos to sculpt out a camera, Jennifer pretty much inspires to recycle and create with these thought-provoking works of art. Used bras now have a better purpose than being stolen by perverts or ending up in landfills. Taking note of the concerns of Japanese women who constantly face the embarrassment of perverts picking out their used bras now have their worries put to rest, thanks to Triumph International’s latest endeavor. The company is now accepting used bras in select stores across Japan which will then be recycled into boiler and power-generating fuel. This could help save tons of waste from ending up in landfills and given that bras are one of the most difficult clothing to recycle, this should help add a bit of green to the garment industry, ensuring proper disposal of old bras. Pizza without doubt is an amazing way to satisfy that growling tummy of yours, dripping with cheese and meaty toppings. However, not many of us have stopped short to pay heed to just what happens to those cartons our 14” circle of joy comes in. Here’s when the Pi Pan project comes handy. These days, about three billion pizza boxes are tossed in dumping yards in the United States alone, causing a tremendous amount of wastage. The Pi Pan project basically projects the benefits of re-usable pizza containers. The project has come up with a lightweight circular tray made of BPA-free stainless steel that keeps your pizza hot inside, without singeing your fingers while working as an oven-friendly container too. Mattel Inc., one of the largest manufacturers of toys in the world today, has decided to wipe itself clean of carbon footprints. And to set off with the same, Mattel will have 70% of its paper packaging composed of recycled material or sustainable fiber. Also, Mattel will focus on maximizing post-consumer recycled content and is looking to keep clean of virgin fiber from controversial sources. And that’s not all. The toy manufacturers are also looking planning to have 85% of its paper packaging be composed of recycled material or sustainable fiber by the end of 2015. We applaud Mattel Inc.’s efforts to go green, and hope this works as an inspiration for toy manufacturers around the globe. Now a compact disk might not be the ideal weight to lift to have those muscles of yours bulging and swelling. Though, when you come to think of it, most woman do use lighter weights than the guys in gyms, making designer Seung-il Kim’s concept pretty interesting and usable! Called the Health Green Up+, this one puts to use old CDs, which each weigh in at about 15 grams, bunched together to create light-weight dumbbells. The concept is indeed a great way to recycle old CDs, most of which collect dust in our homes having their lives ended miserably with the use of DVDs and flash drives.